The number one request I get on a daily basis is “How do I make money with zero investment?”. Well, today, I’m going to show you the best way for you to make money online for free, with affiliate marketing. You won’t have to invest a single penny. I’ll talk more about the 100 day FREE affliate bootcamp later. But if you’d like to jump straight to it, click the button below. This method is going to be for absolutely anyone. We all want a way to make money for free, with no investment needed, right? Well that’s why this is for anyone! However, I would say this is primarily for anyone who’s just starting to test the waters with making money online. If you’ve been a bit sceptical and don’t really feel comfortable investing any money into an online program yet, then this is definitely for you. Or, if you’re a broke individual who actually has nothing to invest. Don’t worry, most of us have been in your position before. But that can all change if you follow this guide to make money online for free. But before we get into it, just because you can make money with no investment needed with this method, doesn’t mean I don’t recommend investing in an online business. I would highly suggest that you invest the money you make from this into more online ventures so you can make EVEN MORE money! So let’s just jump into it. You’re all probably wondering.. How? How can I make money online with 0$ invested? We’re going to become an affiliate for ClickFunnels. ClickFunnels has a very, very good affiliate program where you can earn 40% commissions on every single thing anyone you refer purchases on the platform (I’ll talk more about this later). So what we’re going to be doing is promoting ClickFunnels, and getting people to sign up using our affiliate link. To do this, we’re going to be using free methods to get free traffic. ClickFunnels is an online sales funnel builder. It helps businesses market, sell and deliver all sorts of products online. ClickFunnels makes marketing, selling and delivering products and services very, very easy. They do this by providing pre-built funnel options for specific businesses, products or services. ClickFunnels makes it incredibly easy to create a sales funnel completely from scratch. Usually, when building a sales funnel, you have a lot of stuff to deal with and worry about. Things such as website hosting, creating landing pages, setting up an autoresponder, and the hardest part, getting them to all work in unison. With ClickFunnels, this is all simplified. They incorporate all of those things and even more. Providing everything in an easy to use, unified package. Therefore, saving you the hassle of having to deal with every tool individually. So, ClickFunnels is basically a necessity for ANY online business owner who wants a smaller work load. Another question you’re probably asking yourself is, “why?”. “Why promote ClickFunnels”. There are SO MANY good reasons to promote ClickFunnels. So let’s get into them! It’s Free To Get Started! Our main goal here is to make money online for free with no investment, isn’t it? So that’s why ClickFunnels is perfect for us! 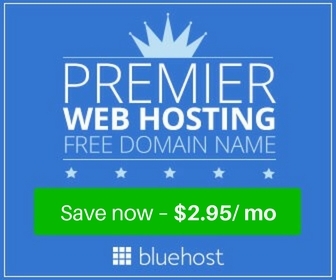 It’s completely free to join their affiliate program and start earning commissions today! 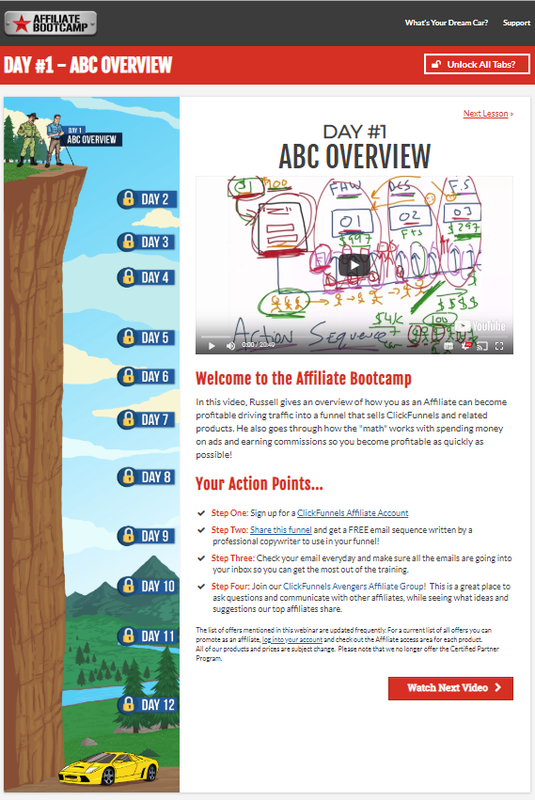 When you click to sign up to become an affiliate for ClickFunnels, you’re going to get access to Russell Brunson’s (ClickFunnel’s CEO) Affiliate Bootcamp. This bootcamp is a 100 day training course that will train you exactly how to promote ClickFunnels and become profitable, driving traffic into a funnel that promotes and sells ClickFunnels and all of it’s related products. He also goes through how the “math” works with spending money on ads and earning commissions so you become profitable as quickly as possible! Spending money on Ads is optional, there are plenty of free methods to get traffic. However, I would recommend investing the money you earn from the free traffic on ads to then earn even more. 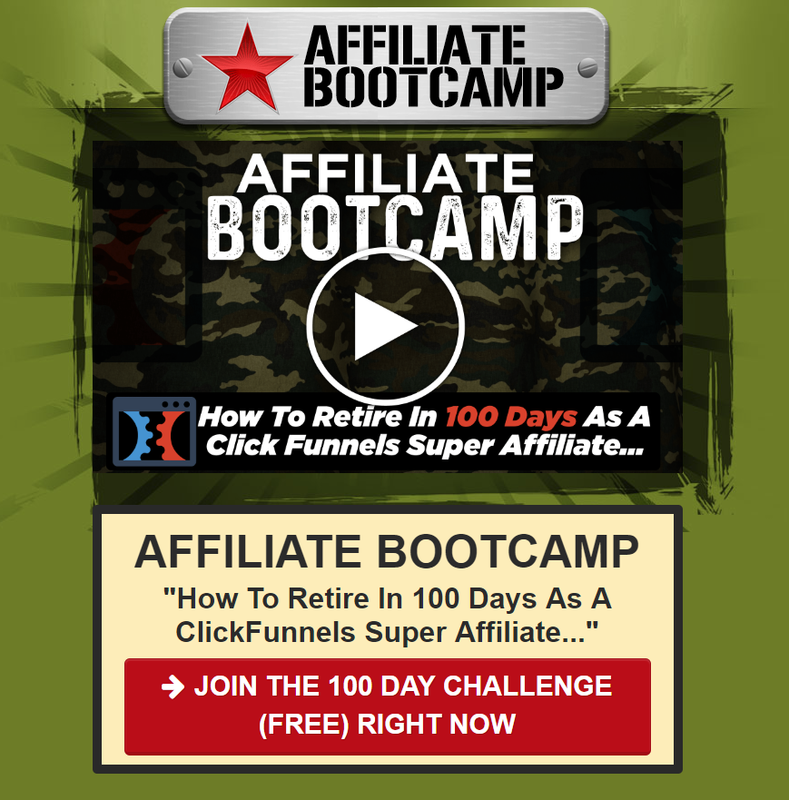 The ClickFunnels software isn’t the only thing we can promote to earn commissions on. There are plenty of other products available too. Here’s an example of one of the funnels you can promote inside of ClickFunnels. It’s a free book funnel, where Russell gives away his Dotcom Secrets book for free, the customer just has to pay shipping (Around $10) and that pays you a $1 commission. But then Russell has a number of up-sells that you can also earn commissions from as you can see in the image above. PLUS the person who got the free book is now ‘sticky cookied’ to you. This means that even just from ordering the free book, ANYTHING they purchase after this, from this free book funnel, and anything else on ClickFunnels, will be commissioned to you and you will get your 40% cut. So, if they purchased every product Russell offers in this free book funnel, your total commissions would be $967. All from simply giving away a free book. Another great thing about ClickFunnels is that you’re going to be getting 40% commissions from every single person you refer, for life. Thanks to the sticky cookie, it doesn’t matter when they purchase something, whether it’s tomorrow or 12 months from now, that commission will come back to you. This is great because Russell will frequently be emailing customers with new promotions, and products. So anything interests the people you’ve referred and they purchase it from Russell’s email, you’ll earn a 40% commission from that sale. So as you can see, there are a lot of good reasons to join ClickFunnels. You can create a blog, much like the one you’re on right now. On this blog you can write numerous different articles about ClickFunnels. You could do a review, a comparison with another similar platform or even a “how to” article just like this one you’re reading now. Once you’ve written some blog posts, you can then share them around where ever you can. Forums, other blogs, social media etc. There are plenty of free traffic options available. YouTube, and videos in general are a very powerful tool when it comes to marketing and promoting anything. Google is now starting to rank YouTube videos at the top of their searches, which can drive A LOT of free traffic to your videos. So, just like writing a blog, there are numerous different videos you can make. You could do one to match each blog, a review video, a comparison video and a “how to” video. All of these methods are completely free. However, like I said earlier, I recommend that any money you make from these free methods, you invest it back into your marketing by paying for ads. This is where you’ll start earning some real good money. Joining and starting your ClickFunnels affiliate journey couldn’t be any easier! Like I said, it’s free. So all you need to do is sign up. You’ll then be taken to a page where you can start your Affiliate Bootcamp training. Follow the steps given to you each day, and you will be well on your way to earning your first commissions from ClickFunnels, completely for free! Ready To Start Your Bootcamp Training? If you’re ready to start now, click the button below to join the FREE 100 Day Challenge!